So much for a day of rest! After a couple of those, it was time to spend Sunday on passagata – walking around the major piazzas and sites at the heart of Rome. We started with the celebration of the Eucharist at the Oratory of St. Francis Xavier, on the Via del Caravita. The road is fairly short, but if you asked most Romans about the Oratory of St. Francis Xavier, they would have no idea what you were talking about. Tell them it’s the church “del Caravita” and then, everyone knows where it is. The oratory is staffed by priests from four different religious orders (Jesuits, Montfort Missionaries, Crosiers, Viatorians) and offered as “An International Catholic Community in Rome”. It is not a parish church, but serves as a community especially targeting sojourners, many o its members have spent their lives travelling internationally, and the typical Sunday Eucharist includes people from as many as 20 countries. The liturgy is in English, with a Spanish mass offered monthly. I was introduced to del Caravita during the vespers service with Cardinal Kasper and Archbishop Rowan Williams in late November. 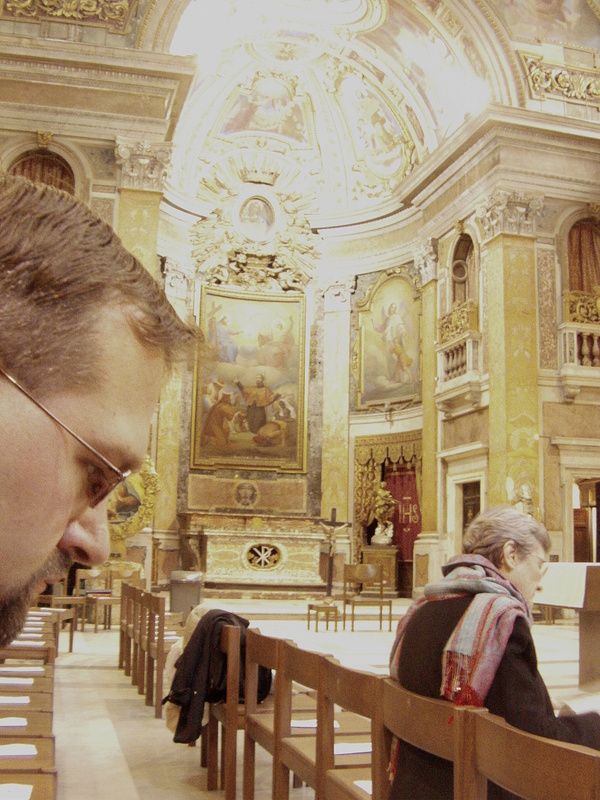 (In fact, if you go to the Caravita website http://caravita.org/ and look at the pictures, you can see Stian and I sitting behind Archbishop Williams while he is preaching). After mass, we met the academic director of Notre Dame’s Rome program for the Architecture school, Steven Semes. Then time for the touring! 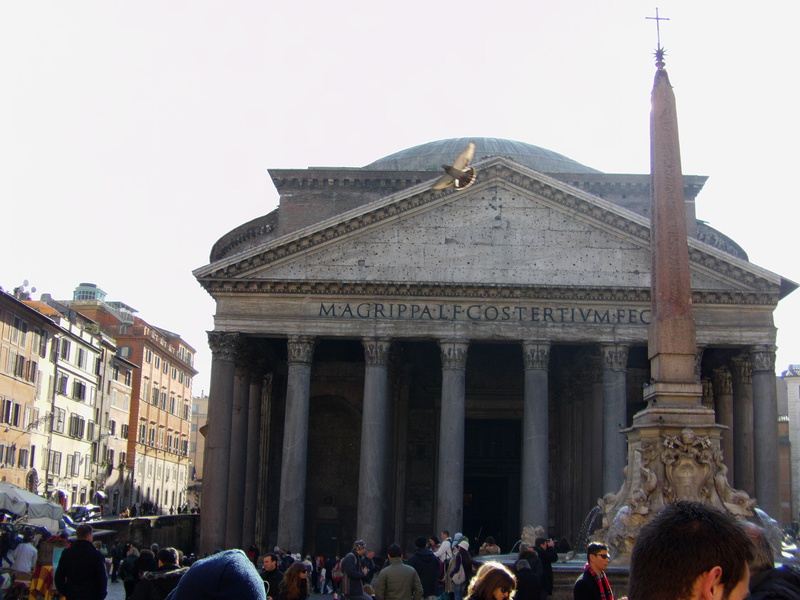 The Pantheon, Santa Maria Sopra Minerva, and Piazza Navona are not far, and it was a pleasure to introduce Nancy to these sites at the heart of Rome. There’s often a street performer of some kind at the Pantheon busking for tips, but this was the first time i had seen a whole flock of art students with their pads out sketching the place. 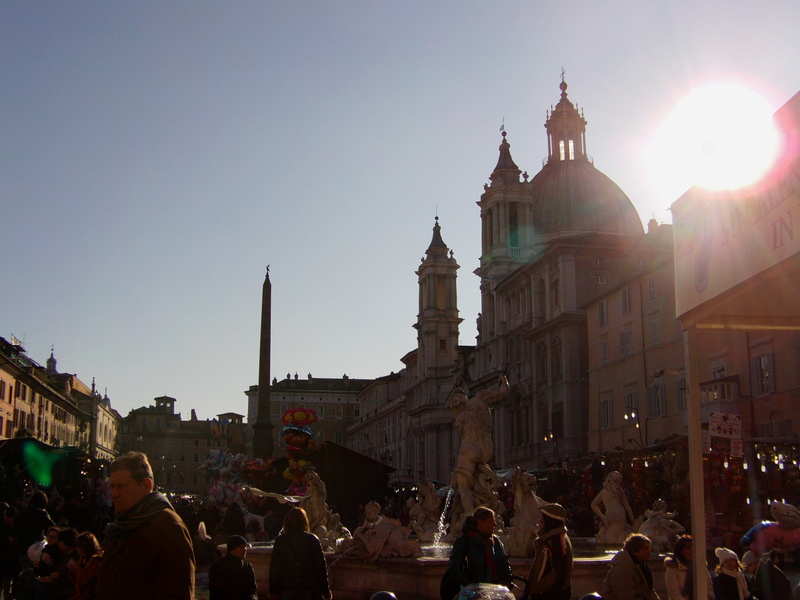 The Christmas bazaar at the Piazza Navona gives the place a different feel – its packed! We stopped in a the famous Tre Scalini on Piazza Navona for cappuccino and their Tartufo gelato – at €5, a treat I had been saving for a special occasion! After picnicking at the foot of Bernini’s Fountain of the Four Rivers, we decided to head back to the Lay Centre briefly, then were off again to All Saints for Lessons and Carols. From there we walked through the Spanish Steps and to Piazza del Popolo looking for the display of Nativity scenes, but to no avail (I found out later they were located above the Piazza, not in it). A long day, and there’s still so much to see! It has been almost a month since the CDF press announcement of the apostolic constitution, Anglicanorum Coetibus, which was released a couple weeks later. As with all Vatican documents, the title comes from the first two words in the official Latin edition, in this case, “groups of Anglicans” – though I prefer the translation “flocks of Anglicans”, probably inspired by the starlings and their Tiber-crossing aerial acrobatics, or the wishful thinking of certain (Catholic and secular) media outlets. Along with the constitution itself, a set of complimentary norms and an official explanatory note was issued. The later is written by the rector of the Pontifical Gregorian University here in Rome, Gianfranco Ghirlanda, SJ, a native Roman who is trained as a civil and canon lawyer – which is an important lens to keep in mind when reading his commentary. In the last three weeks, I have heard this issue addressed, in person, by Archbishop Rowan Williams, Cardinal Walter Kasper and about a dozen other curial officials, Catholic ecumenists, and Anglicans. My comments and conclusions remain my own, so do not blame any of them for my errors, but each conversation has provided some insight to various aspects of this issue, for which I am grateful. Much has been said of the Holy See’s lack of a modern communications strategy this last year, starting especially with the lifting of the excommunications of the (still) schismatic bishops of the Society of St. Pius X. In this case, the timing issue has been remarked on a great deal. But let us be realistic: This is the Vatican. In Rome. Do you have any idea how long it takes to get anything done here? How many good people in the Church have been frustrated by an organization that prides itself in “thinking in centuries”? Should we really believe that this was an ambitious gambit at Ecclesial Imperialism incited only by recent developments? A rushed effort to ‘fish in the Anglican pond’? I honestly think the more likely answer is that this is, at least partially, the long, slow, overdue response to requests that came way back in 1997 from some groups that left communion with the Anglicans at that time, just as the 1980 Pastoral Provision was a response to a smaller-scale situation in the 70’s. These former Anglicans are likely the ‘target demographic’ rather than current members of the Anglican Communion. I would not be surprised if some draft of something like this had been floating around in a dusty file cabinet in the CDF for the last decade or more. It is probably, genuinely intended as a pastoral response by some in the Congregation for the Doctrine of the Faith, and possibly the Secretariat of State. However, these impulses have not benefited from the full reception of, or formation in, ecumenical dialogues and relationships. The internal, inter-dicasteral communications and collaboration is also clearly a problem, and it has not improved much in the eight years since Dominus Iesus. The Pontifical Council for Promoting Christian Unity was not properly consulted in the development of the document, only verbally informed of it after it was in process. Cardinal Kasper did say on Thursday after the Colloquium that he had seen a draft of the Apostolic Constitution before the official promulgation, and was invited to make recommended changes, but he did not mention the accompanying documents, and this may have happened after the initial press conference with Cardinal Levada and Archbishop DiNoia. Externally and ecumenically, the Archbishop of Canterbury and his staff, as well as even the Catholic Bishops’ Conference of England and Wales was likewise not consulted or involved in the process, but only informed shortly before the press conference. Seemingly it was informing them that motivated the conference, for fear of leaks before the Constitution was finalized. The official responses are out there to read on the internet. Bishop Chris Epting, National Ecumenical Officer of the Episcopal Church, has recently blogged about the issue; and the press has been following Archbishop Rowan Williams everywhere in Rome, so there is no shortage of coverage. This was usually followed by disappointment in some key aspects once the constitution, complimentary norms and explanatory note came out. After a little time, there has been a sense of betrayal of the ecumenical bonds of unity that already exist and anger at what seems to be promotion of an “ecumenism of return”, which the Catholic Church disavowed 50 years ago. One local Anglican’s comment of “not being angry about this… but then being surprised at how angry I was” is echoed in several remarks, also among dedicated Catholics sensitive to the challenges currently facing the Anglican Communion. Personally, I was initially excited too, “What if they all came? What if we could just have unity now?”… for a few minutes. Then a mea culpa for my momentary indulgence in ecclesiastical imperialism, and my thoughts turned to friends yearning for full communion, and the personal discernment of one friend in particular between coming into communion personally or continuing the long slow work of full ecclesial union. The Personal Ordinariate structure was not foreseen in the 1983 Code of Canon Law, so Pope John Paul II created it specifically for the military ordinariates in 1986. The point missed in most of the media is that this is specifically a structure for the People of God – unlike a Personal Prelature (eg, Opus Dei) or the pastoral provision, which are specifically about clergy. The personal ordinariate is a personal diocese, not just a provision to “get married priests” in through the back door and “fill the dwindling ranks”. Were that primarily the motive, I think we would have just had a personal prelature. Neither is it a full, autonomous Church sui iuris (or Particular Ritual Church) like the 23 Churches that make up the one Catholic Church. (That is, the Roman Catholic Church, Maronite Catholic Church, Ukranian Greek Catholic Church, etc.) This is a model proposed at various times in the ecumenical conversation as a juridical/ecclesial structure for eventual full communion, with the Archbishop of Canterbury as the Patriarch (or Major Archbishop). Fr. Ghirlanda’s commentary acknowledges that the creation of such a structure could create “ecumenical difficulties”, without elaboration. Not knowing which difficulties he was thinking of, two immediately come to mind: 1) the idea that such a structure should be reserved until such time as we do attain full communion between Rome and Canterbury, and to do so now would be really insulting to the Anglican Communion and its leadership, and 2) a concern for our relations with the Eastern and Oriental Orthodox, who might object to the unilateral establishment of a new patriarchate by Rome that did not exist as such during the first millennium. However, the reason given in the commentary is that “the Anglican liturgical, spiritual and pastoral tradition is a particular reality within the Latin Church.” This has been one of the moments of pause for some Anglicans and former Anglicans who might otherwise consider the move. I think this can be read positively, as acknowledging a genuine tradition that goes beyond local custom and has a proper place in the Catholic Church today at a level similarly given to, say, the “extraordinary form” of the Roman Rite, rather than seeing it as a ‘non-Catholic creation of the English Reformation’. However, it seems safe to say that the English church has long recognized in itself an ecclesial tradition distinct from the Roman church, even for the many centuries of full communion, which goes beyond just liturgy and spirituality to a full ecclesial sense, including juridical, pastoral, and theological practices. This limited recognition is not as generous as would have been hoped. When is a bishop not a bishop? Would a rose by any other name still smell as sweet? If it walks like a duck, swims like a duck, and quacks like a duck, isn’t it a duck? One of the first discordant notes from the press announcement three weeks ago was around the identity and role of bishops and the ordinary in the personal ordinariates. Anglicanorum Coetibus basically sets up the ordinariate and outlines the responsibilities of the ordinary and the consultative structures. It gets interesting in the complementary norms (particular law). First, in article four of the norms, it is noted that the ordinary may be a bishop or a presbyter. While allowing a presbyter exercise ordinary power is not unusual in itself, it is odd for the role equivalent to a diocesan bishop. In fact, the canons specifically mentioned in this article are describing the roles and responsibility of a diocesan bishop. A former Anglican bishop may be appointed as the ordinary, but he would be only ordained as a presbyter. A former Anglican bishop who is not ordinary could be asked to assist the ordinary in administration of the ordinariate. Any former Anglican bishop would be a part of the bishop’s conference in their territory (such as the USCCB), with a status equivalent to retired bishop. Finally, any former Anglican bishop who is not ordained as a Catholic bishop may request permission to continue using episcopal insignia (mitre, crozier, pectoral cross, ring, and presumably the amaranth red zucchetto, fascia, and simar). While the first point seems to say that a former Anglican bishop could not be ordained as a bishop, even if he is the ordinary, the last point seems to indicate that at least some former Anglican bishops could be so ordained, and the rest could continue to wear bishop’s regalia even if they are not ordained as bishops. This is where any interest in ‘coming over’ grinds to a halt for many Anglo-catholics, especially the clergy. Among Catholic ecclesiologists, ecumenists, church historians and sacramental theologians, this is probably where there was a collective raising of eyebrows. The three issues here are the use of Episcopal insignia by non-bishops, the nature of Anglican orders and of ordination in the personal ordinariate, and the whole of the final sentence regarding ordination of married men to the episcopate. Originally, of course, bishops did not wear anything different than the rest of the people of God. After Christianity became the official religion of the empire, Emperors began appointing Christian bishops to civil magistrate posts. These secular offices included the insignia of a ring and what have become the crozier and mitre. As the empire dissolved and the Church took on the role of the state more completely, they became identifiable with the episcopal office, but continued to have a secular connection. The whole (unfortunately named) lay investiture controversy of the 12th century had nothing to do with the role of the laity in electing their bishops (which was traditional), but with the role of the secular rulers appointing bishops themselves and/or retaining the right to invest them with the ‘secular’ signs of office: ring, mitre, and crozier. Significant to that argument and church practice since is that these are insignia of the episcopal office, and are neither appropriate for non-bishops to use nor for non-ecclesiastical authorities to confer. The exception to this concerns some of those who are equivalent to a bishop in office, such as an abbot (and in some places in the past, an abbess). Given that exception, it would be consistent to allow the ordinary of the personal ordinariate to retain episcopal insignia even if he was only a presbyter. Secondly, the practice of having non-bishops dress or act as bishops seems to imply the Tridentine theology of the episcopate as a merely juridical office, rather than as an order in itself. If a presbyter has the fullness of orders, and being bishop is just a “job”, then a presbyter can dress as a bishop or fulfill a bishop’s office (eg, ordinary) without actually being a bishop. Catholic ecclesiologists and sacramental theologians are not too happy about that possibility. Many catholic-leaning Anglicans are that way because of a Catholic understanding of the sacraments, including holy orders and the Eucharist. They may have been interested in the personal ordinariate if offered a “conditional” ordination, which would at least acknowledge the possibility of, or partiality of, sacramental validity of their current ordained ministry. But absolute ordination means a betrayal of their (very Catholic) sacramental sense of their current ministry, which is not appealing. In the 113 years since Apostolicae Curae, Catholic historians, theologians, and ecumenists have developed a more nuanced understanding of Anglican orders. The bull is considered definitive church teaching on precisely the issue with which it deals – Anglican ordinations conducted according to the Edwardian Ordinal from 1552 until 1662. Church historians have discovered at least some places where this ordinal was not used, and so would not be subject to the declaration of nullity. More recently, there have been more and more Anglican ordinations including bishops of the Old Catholic churches, which are generally recognized as valid in the classic Catholic understanding, and the Scandinavian Lutheran churches, which also maintain an historic episcopate with a claim of apostolicity. Even the Catholic understanding of ordination vis a vis Apostolic Succession and Tradition has enjoyed development, at least in ecclesiological circles, in moving from a “spiritual heredity” model to a more collegial understanding of succession and ordination as incorporation into the episcopal college. Given all of these, it was disappointing for many that the ordinations of former Anglican clergy were not classified as conditional. This could be understood either as “just in case” their former ordinations were either absolutely invalid or merely defective, or, even better, as a sign of their incorporation into the episcopate, presbyterate, or diaconate in communion with the ordinary and the bishop of Rome, without judgment on the state of their current orders or past ministry. Finally, there is the sentence about married bishops. The best way to read this is to recall that Fr. Ghirlanda is primarily a canonist, and is a native Roman. In the current canonical situation, it is true that married men are absolutely excluded from the episcopate in the entirety of the Catholic Latin and Eastern traditions, as well as in the Eastern Orthodox tradition. Historically, of course, married men have been bishops (and before that, apostles). This was common in the Latin tradition, and not unheard of in the east, until celibacy became a universal norm in the Latin Church during the 12th-16th centuries. Early on, the practice of selecting monastic (and therefore celibate) presbyters to be bishop became the norm in the East, while the West continued to select bishops from the diocesan (and therefore married or celibate) diaconate and presbyterate. Ecumenically, the Orthodox Church recognizes this historic difference in praxis, and does not generally object to married bishops in the Latin Church. Theologically, there is no impediment to a married man being a bishop in either the Catholic or Orthodox traditions, and in fact scripture commends it – though, admittedly, limiting bishops to only one wife. Being a Roman, Fr. Ghirlanda has no doubt been to the Basilica of Santa Praessade, and has seen the 9th century mosaic of Episcopa Theodora. If he had meant that in the entire Latin Catholic tradition, historically and theologically, the admission of married men to the episcopate was absolutely excluded, then he would be confirming the interpretation that Theodora was not the wife of a bishop, but was in fact a bishop herself. This seems unlikely. As “the Anglican liturgical, spiritual and pastoral tradition is a particular reality within the Latin Church” according to the official commentary, their pastoral tradition of synodality (collegiality and collaboration) is also worthy of emulation in the entire Latin church, and perhaps some of the norms in this section will be applied throughout the church. Even if not, they are interesting in themselves. A “governing council” combines the basically redundant structures of presbyteral council and college of consultors currently mandated in the Code of Canon Law. It is given deliberative voting powers on a number of issues, and interestingly, prepares the terna (list of three names) from which the Holy Father would appoint the ordinary. For most Latin dioceses, this terna is currently prepared by the Apostolic Nuncio, with consultation of the region’s bishops, some other clergy, and virtually no input by laity. Further, the pastoral and finance councils are mandated not just for the ordinariate, as is the case for all dioceses, but also for all parishes in the ordinariate. For most Latin dioceses, the parish pastoral council is merely recommended. However, the language for pastoral councils in the norms is that they are “advisory” rather than the stronger “consultative” which is in the Code, though this is a common misreading of consultation, so perhaps it was not meant as a change. Some former Anglicans may accept the offer, but I do not think it will be a large number. Even fewer current Anglicans will, I think. The most interested will thankfully continue to work on full ecumenical unity, distant as that always seems. I am interested to see how this develops, or if it develops. 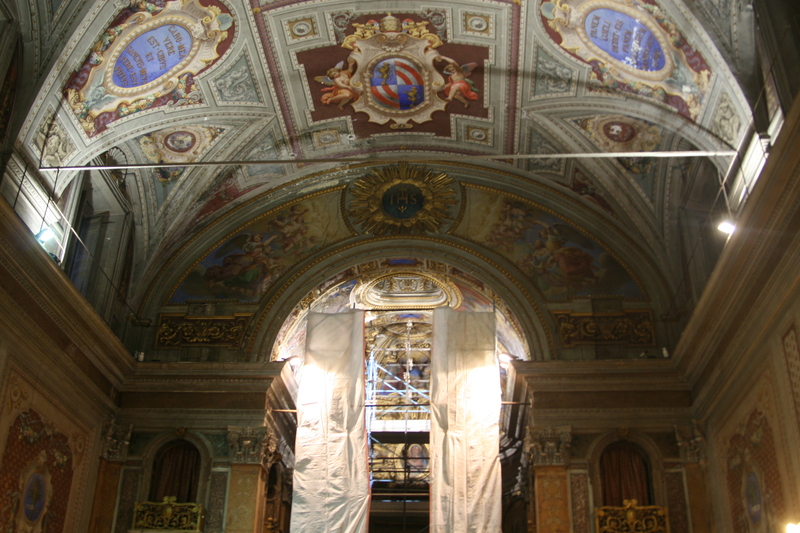 One curial official described the personal ordinariates thus: The Holy See has set aside an empty room, but without furniture, electricity, or provisions. Now we are asking Anglicans to fill the room, without being able to bring anything with them other than themselves. It may remain empty for a long time. In the mean time, the Anglican Roman Catholic International Commission (ARCIC) III preparatory commission is meeting in Rome this week, including my own bishop, Archbishop Alex Brunett as co-chair. This, after a hiatus since 2005, prompted by the developments in the Anglican Communion – a hiatus which some predicted would never end. If Anglicanorum Coetibus were really the Holy See’s ecumenical answer the Canterbury’s internal struggles, ARCIC III would be dead in the water. Yet, they seem energized and ready to go, so it will be interesting to see whether ecumenical dialogue or corporate conversion takes center stage over the next few months. The Apostolic Constitution, Complementary Norms, and commentary can be read together here. The Oratory of Saint Francis Xavier “del Caravita” is one of those churches in Rome you would never find unless you knew where to look, even though it is just off one of the main thoroughfares in the City. It is described as “an international catholic community in Rome”, Jesuit in origin but staffed by priests from four different orders. Aside from the national churches for the U.S., England, Ireland, and the Philippines it is the only Catholic church offering weekly Sunday liturgy in English. On Friday, we celebrated evening prayer presided by Cardinal Kasper, with Archbishop Rowan Williams as the homilist, sponsored by the Anglican Centre in Rome. A simple and beautiful liturgy with what I thought was an especially powerful version of the renewal of baptismal vows, it was a nice counterbalance to the Colloquium the day before: a day of academic lecture complemented by an evening of prayer. 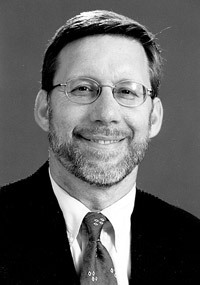 Author of seven pastoral booklets, eight books, and over 100 journal articles, Dr. Richard R. Gaillardetz is one of the most accomplished U.S. ecclesiologists of the current generation. He has been a member of the U.S. Catholic-Methodist dialogue, and his doctoral director was Dominican Father Thomas O’Meara at Notre Dame (who was also my systematics and ecclesiology professor as an undergrad). Rick is married, with four children, and currently serving as the Murray/Bacik Professor of Catholic Studies at the University of Toledo (Ohio, not Spain). 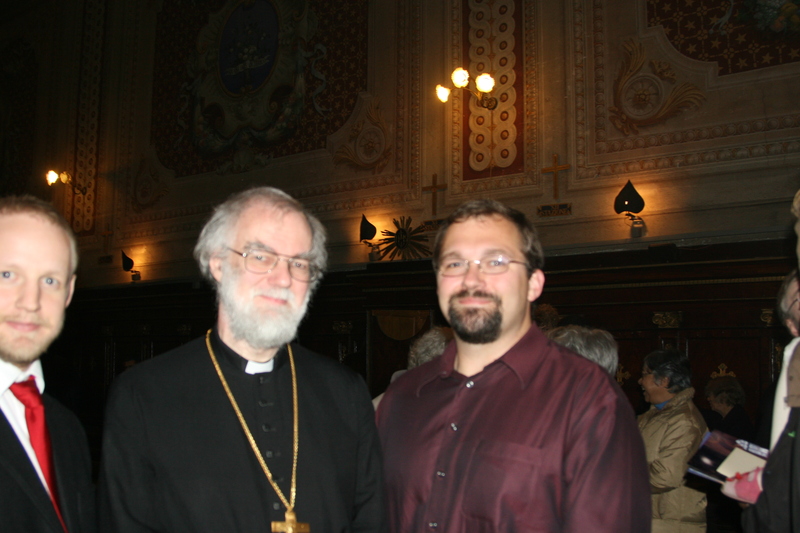 The Venerable Jonathan Boardman is an Anglican presbyter, rector (pastor) of All Saints parish in Rome, and Archdeacon of Italy and Malta for the Anglican diocese of Gibraltar, which covers all of continental Europe. Professor Gaillardetz has written a great deal in exactly the areas of ecclesiology that interest me, including ecumenism, the diaconate, lay ecclesial ministry and a wide range of other topics. I have no doubt that his work will make a significant contribution to my thesis and dissertation, and it is always a blessing to make a real-life connection with someone whose work informs your own. Father Jonathan I have met on my two forays to All Saints, first for their dedication feast – the Sunday after the press announcement of the Personal Ordinariates – and for Stian’s debut as Evensong Acolyte Extraordinaire. His comments on the Personal Ordinariates, and his personal openness about his reactions since the first announcement and the subsequent publication of the constitution, were welcome, enlightening, and honest. “I am not angry about all this… and yet, I’m surprised how angry I was!” probably best describes one of the most common reactions, echoed by Father Boardman while relating an incident where an innocent joke about “competition” [between Catholics and Anglicans] by a Vatican colleague touched a raw nerve. While both the Archbishop of Canterbury and the Holy See’s own Council for Promoting Christian Unity had little notice before the public announcement, and many Anglicans and Catholics alike have seen this as either “arrogant” or at least “unilateral and insensitive”, some Anglicans have also noted that it is not as if the Anglican Communion or its constituent national churches have always consulted Rome or Constantinople before making a decision that had ecumenical ramifications (such as the ordination of women to the episcopate). Further, as my friends remind me, there are probably more Catholics – including priests – who have “swam the Tiber” in the other direction than Anglicans who have come into communion with Rome over the last three or four decades. We also spent some time discussing the theology of the episcopate – or lack thereof – in the apostolic constitution, and wondered why at least a “conditional” ordination wasn’t proposed given the development of Catholic theology on orders in general and Anglican orders specifically since Leo XIII issued Apostolicae Curae. I have an upcoming post updating my thoughts on the constitution, and I am incorporating some of my gleanings from this conversation there, so I do not want to duplicate it here! Two days ago, Rome announced a forthcoming Apostolic Constitution establishing Personal Ordinariates for former Anglicans seeking full communion with the Catholic Church. As the Constitution itself has not been actually published, there’s a great deal more speculation on the blogs and newswires that real information, but a few things were made clear in the news conference. Unfortunately, my presence on Vatican property and proximity to the halls of power has not really increased my access to information about the decisions made there. We did have dinner tonight with an official from the Pontifical Council for Promoting Christian Unity, however, which probably would not have been possible in Seattle – so there are some advantages! The “note” and press conference was delivered by two of the highest ranking Americans in the Holy See, Cardinal William Levada, prefect of the Congregation for the Doctrine of the Faith, and Archbishop Augustin DiNoia, secretary (#2) in the Congregation for Divine Worship and the Discipline of the Sacraments. Why two Americans? Why no Brits? Probably because of the offices they hold, but Romans seem to be skeptical of coincidences. I’m merely curious. Conspicuous by absence is any representative of the Pontifical Council for Promoting Christian Unity. Indeed, Cardinal Kasper, president of the council, is not even in Rome, but in Cyprus for the 11th meeting of the Joint International Commission for Theological Dialogue between the Catholic Church and the Orthodox Church. Personal Ordinariates are not exactly like a Personal Prelature (which is what Opus Dei is), but are basically what the Military Ordinariates are – essentially a diocese serving people of a certain characteristic rather than a geographic structure. Instead of members of the armed forces, the membership will be former Anglicans. Something like this, or the establishment of a new Church sui iuris with its own patriarch or major archbishop, has been discussed as a structural option for the future full communion between the Anglican Communion and the Catholic Church. I think that may still be seen as an eventual option, because the Personal Ordinariates are not fully autonomous churches in that sense, but particular churches like a diocese, still within the context of the Roman church and its national conferences. Nevertheless, the specter of “uniatism” will no doubt be raised again in the Eastern Orthodox world, and possibly, in the Anglican and Protestant world too. This move could be seen from those corners as proof that Rome really is just interested in co-opting non-Roman liturgical and theological patrimony just for the sake of proselytism. While such an accusation has some historical bases, especially concerning the Latinization of Eastern Catholic Churches, it is clearly not the reality of the current Eastern Catholic Churches, and I do not think it is the reality for these Personal Ordinariates, either. Still, the perception itself could be damaging to the ongoing reception of ecumenical advances with the apostolic chuches in the East. Historically, the Latin Church has had married bishops, at least when we also had married presbyters and deacons as a rule (that is, most of the first 1200 years). If we do not have a requirement of celibacy for either deacons or presbyters, as would be the case in these Ordinariates, there is no historical reason for requiring it of bishops (in Western practice). Ecumenically, as far as I am aware, to restore this discipline would not pose a challenge to the Orthodox, as they see no objection to the Western Church having married bishops even while the Eastern Church does not. The difference in custom is based on the practice of selecting bishops from the diocesan clergy (as in the West) rather than from the monastic clergy (as is most common in the East). So while there is historic precedent for a celibate episcopate in the Eastern Catholic and Orthodox churches, it does not hold for the Western churches, except inasmuch as we currently have a (mostly) celibate presbyterate and have discontinued the ancient practice of selecting bishops from the diaconate. I would really like to see the ecumenical and historical rationale behind this piece of the note; presumably it is in the forthcoming Apostolic Constitution. Either way, it has got my curiosity piqued; I’ll look into it and follow up!